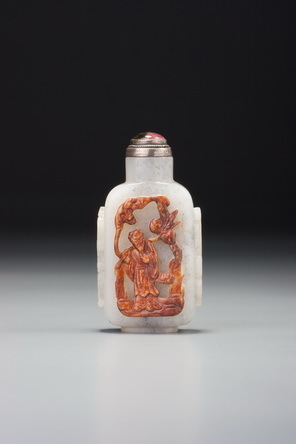 We have coined the term ‘Master of the Rocks’ school for the group represented by this snuff bottle and, among others, Sale 1, lot 45; Sale 2, lot 122; Sale 2, lot 148; Sale 3, lot 50; and lot 44 in the present auction. 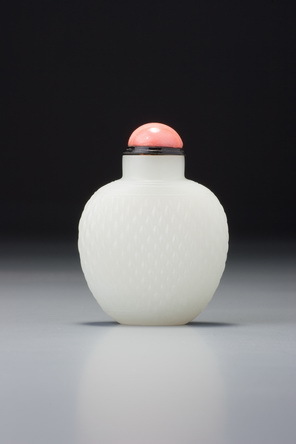 Although this bottle is very clearly of the school, its material is unusual for the school. This sort of grey nephrite with darker grey markings was more commonly used by the Suzhou school. The form was a popular one for the Master of the Rocks school, with gently rounded edges and corners still allowing for an essentially rectangular reading of the shape. This particular bottle is a valuable clue in resolving the question of whether the core group with its distinctive landscape and figure style is from the same workshop as the chi-dragon decorated bottles, which are sometimes found in the standard ‘yellow-steamed chestnut’ material favoured by the school (see, for instance, Sale 2, lot 122). Here the dragons on the narrow sides are very similar in style to those of Sale 2, lot 148 and equally convincingly and fluently carved. We have suggested that chi dragons were a popular motif at or for the Qing court on a wide variety of wares, but specifically on jade carvings. Part of our reasoning was that such beasts do not appear as the main decorative motif on wares definitely associated with other known centres of production. If, however, this bottle links the Master of the Rocks school with the related chi-dragon bottles, and if they were made at Suzhou--admittedly a lot of ‘ifs’--then the argument for identifying these dragons primarily with the court is weakened—unless this group represents production at Suzhou for the court, which we know took place on a fairly grand scale (see Yang Boda 1992). As a work of art, this fulfils all the technical and artistic expectations we have of the best of the Master of the Rocks school. The skin is used in an unusual way for the school in that it is entirely confined to the relief detail. This is another possible connection with Suzhou, where the classic wares also used colour in this way. The carving is as superbly controlled as any from the school, with the evocative subject very clearly separated from the ground plane, which is finished to perfection with a slightly matt, textured ground, standard to the group. The design is simple, partly because it is entirely defined by a different colour, but nonetheless superbly carved. This is particularly apparent in the carving of the bat, superbly exaggerated in the length of its wings and very elegantly curved around one upper corner of the design to act as a convincing bat and to form part of the integral frame which the design sets up for itself. The symbolism is both obvious and ubiquitous. The inscription indicates that the man with the peaches is Dongfang Shuo (154 – 93 BCE), a sharp-witted official under Emperor Wu of the Han. There was a belief that he was the essence of Jupiter; this was the conclusion drawn from the fact that Jupiter supposedly disappeared from the heavens during the eighteen years Dongfang was at court. Another aspect of his legend is that when the Queen Mother of the West came to present her peaches of immortality to Emperor Wu, she pointed at Dongfang and said, ‘He stole my peaches on three occasions!’ Dongfang Shuo is thus identified with the Longevity Star, and pictures of him with peaches are used to convey birthday congratulations. Your wit leaving the common sort behind.